Woodbridge, VA---With two consecutive Carolina League Marketing & Promotional Excellence Awards secured, the Potomac Nationals look to make it three in a row with a stacked promotional schedule for the 2019 season at Northwest Federal Field at Pfitzner Stadium. With new promotions, the best bobbleheads in the business, slick custom theme jerseys, other premium giveaways, and many celebrity appearances, it will once again be a great time at The Pfitz! Throughout the season, the organization will pay tribute to the past 35 years at Northwest Federal Field at Pfitzner Stadium with unique premium theme nights, giveaways, and additional promotions. "In preparation for the Potomac Nationals' upcoming 2019 season at Northwest Federal Field at Pfitzner Stadium, our club is so excited and proud to kick off what we feel is one of the best promotional schedules in our team's history," said Potomac Nationals General Manager of Sales, Bryan Holland. "The Red, White, and Blue faithful will enjoy a Potomac Nationals' 2019 promotional slate that will pay tribute to the previous 35 years of baseball and family-friendly fun at The Pfitz, while our upcoming promo schedule is packed with some of the best bobblehead giveaways in all of Minor League Baseball, a star-studded celebrity autograph signing appearance lineup, and countless premium theme nights, special events, and one-of-a-kind promotions that will appeal to the entire family," said Holland. The top family-friendly affordable entertainment venue in Northern Virginia will host an expansive slate of one-of-a-kind promotions courtesy of the Potomac Nationals. Another stacked bobblehead lineup and attention-grabbing theme nights will pair with five fireworks shows that will light up the Woodbridge night sky. Yet to be matched in the Carolina League, and maybe even Minor League Baseball, the creativity from the organization has led to a promotional schedule that will include six bobblehead giveaways, a legendary celebrity appearance lineup, three Scout Nights, seven custom theme jersey auctions, wide-ranging theme nights, which will include celebrations of Indiana Jones and the Temple of Doom, Ghostbusters, Field of Dreams, and much more,and the top Fourth of July festivities and fireworks in Northern Virginia! "As humble recipients of back-to-back Carolina League Marketing & Promotional Excellence Awards, our front office staff is ready to rise to the challenge of a three-peat with respect to perennial promotional prowess within our circuit as we strive to be one of the most forward-thinking, outside-the-box organizations in the Minors," said Holland. Fireworks will grace the sky at Northwest Federal Field on select nights as well as the Fourth of July in 2019. Fans can come see a fireworks extravaganza on Saturdays (June 8th, June 22nd, July 20th, and August 10th, all presented by Northwest Federal Credit Union), and the Fourth of July. "The P-Nats are prepared to put on an excellent show in 2019 that will honor the decades of success our franchise, our fans, our corporate partners, our community partners, and our booster club members have enjoyed in Prince William County at The Pfitz," said P-Nats General Manager of Operations, Aaron Johnson. "Northwest Federal Field at Pfitzner Stadium will be the place to be next spring and summer for the best in first-class entertainment in Northern Virginia, and we can't wait to welcome our fan base back to the Home of the Potomac Nationals for our 36th campaign of P-Nats Baseball," said Johnson. In keeping up with what is now an annual tradition with the P-Nats, the Legends Autograph Series, presented by Northwest Federal Credit Union, will return for 2019. In a celebration of the 30th Anniversary of the movie Field of Dreams, actor Dwier Brown, who played John Kinsella in the film, will be on hand on Saturday, August 10th to headline the autograph series. The entire 2019 Legends Autograph Series celebrity appearance lineup will be announced in the New Year. Free autographs will be available on a first-come, first-served basis. As the years have moved on, the bobbleheads given out at Northwest Federal Field have just gotten better and better, and 2019 is no exception. Set to feature a celebrity guest, and former Potomac Nationals players, five different bobbleheads will be given away to the first 1,000 fans through the gates at the ballpark on Saturdays in 2019! Throughout the season, P-Nats players and coaches will wear special Military Appreciation Jerseys on all Sundays, Military Appreciation Night, Memorial Day, and Independence Day. These jerseys, presented by Northwest Federal Credit Union, will be auctioned off on the final Sunday of the regular season (8/25) to benefit the Women Veterans Interactive. A trio of Scout Nights in 2019 will allow both Boy Scouts and Girl Scouts to participate in pre-game festivities, take in a P-Nats game, catch a post-game fireworks extravaganza, and camp out on the field at The Pfitz with a movie on the video board. Scout Night dates for 2019 are Saturday, June 22nd, Saturday, July 20th, and Saturday, August 10th. As part of the P-Nats' comprehensive community relations initiative, Uncle Slam's Reading Program is back once again. This program encourages local school kids to read books and then come out to a P-Nats game. Each date as part of Uncle Slam's Reading Program is paired with a special theme. Over the course of the season, the P-Nats will welcome day cares and summer camps to Northwest Federal Field at Pfitzner Stadium. Day Care/Summer Camp games in 2019 are scheduled for Tuesday, 7/9, and Thursday, 8/1, with both games scheduled for 12:05pm. A complete 2019 Potomac Nationals Promotional Schedule will soon be published online at www.potomacnationals.com. 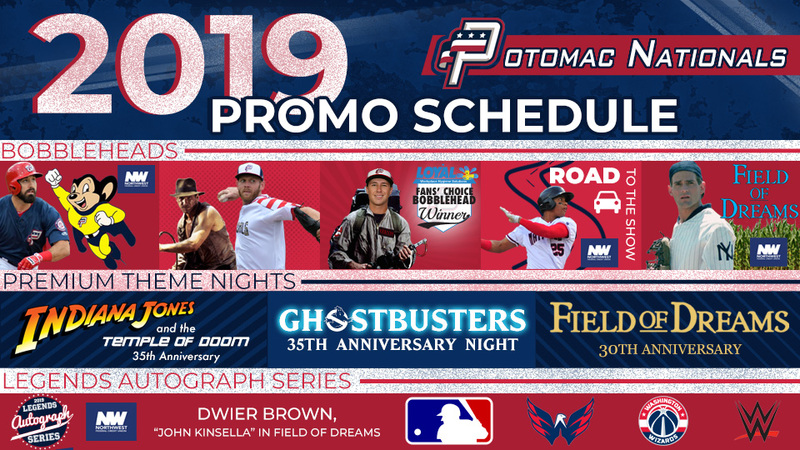 Note: All Potomac Nationals' promotions and promo dates are subject to change. Game times for all P-Nats' home game dates will be announced in early 2019. P-Nats Opening Day 2019 at Northwest Federal Field at Pfitzner stadium is scheduled for Thursday, April 4th, as The Red, White, & Blue will host the Fayetteville Woodpeckers (Houston). 2019 Mini Plans will go on-sale on Friday, December 21st. P-Nats' 2019 ticket plans, group events, and fundraisers are currently on sale. For more information or to purchase any of these, contact Potomac Nationals Director of Season Ticket & Group Ticket Sales, Alec Manriquez, by phone at 703-590-2311 ext. 221, or via e-mail at amanriquez@potomacnationals.com.